The Spokesman-Review published this Murrow News Service story by Jennifer Ladwig on Sept. 29, 2017. Behind the red double doors of room 96, two officers flanked an intoxicated young man. “Who’s the president?” one officer asked. 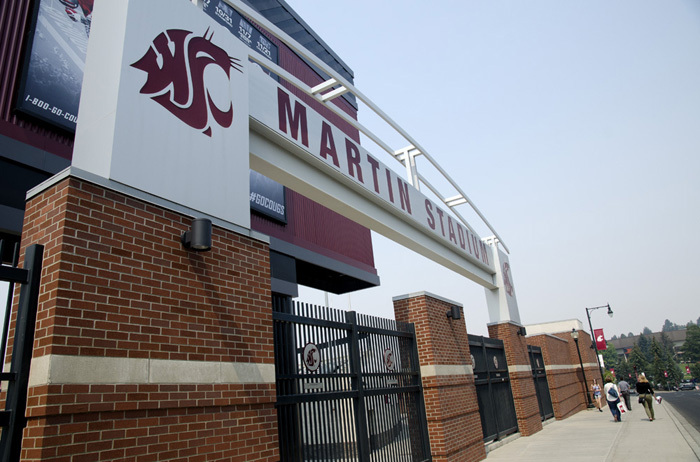 Beneath the stands of cheering fans, room 96 of Washington State University’s Martin Stadium serves as a temporary waypoint for disorderly and intoxicated visitors. Each game, about 15 people are processed, often to be booted from the game and released, according to WSU police Officer Joseph Kirshner. In extreme cases, they are turned over to local police. Kirshner has manned the room for more than six years, and is responsible for filing an incident report for each person who comes through the red doors. He also checks the names of the people brought in to see if they have an existing arrest warrant. The officers regularly see people detained for fights, verbal abuse and domestic violence. But the most common reason fans pass through room 96 is alcohol, Kirshner said.